This week, Unified European currency started to strengthen against the American dollar. The pair EUR/USD has pushed off from the bottom limit of the trading channel (1.3470) and is now trading in the range of 1.3505-1.3545. Spanish news about tax reform scheduled for Q1 this year, has raised optimism among buyers of Euro. Government of Spain plans to gradually reduce tax rate for added value and income of individuals to stimulate domestic demand. Earlier, Spanish prime-minister said that taxes had been increased in order to fight budget deficit; however, since economy has started to recover, tax policy could be reconsidered. Nevertheless, in order to reduce tax burden it will be necessary to increase public taxes, which will have a negative impact on economic growth pace in the country. Retail sales index of Eurozone will become known on Wednesday, which is likely to fall to the level of -0.7 as well as European index of business activity, which is expected to remain unchanged. 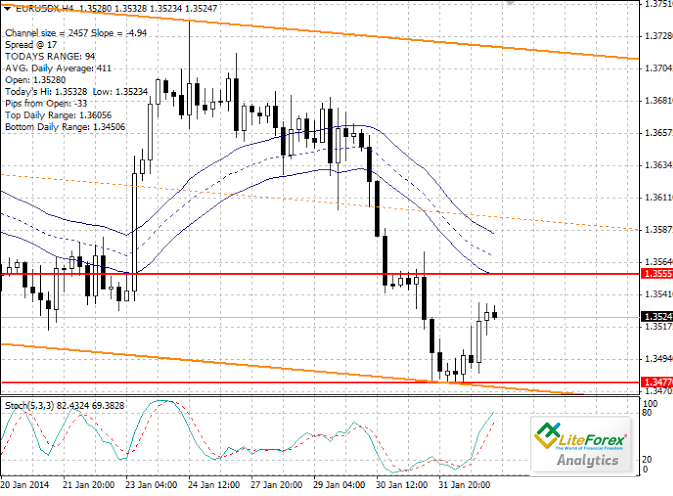 The nearest resistance level is the moving average with the period 34 (1.3557). Support level is the bottom limit of the trading channel (1.3470). It is advisable to open short positions after breakdown of the level of 1.3470 with protective orders at 1.3500 and a target of 1.3342.